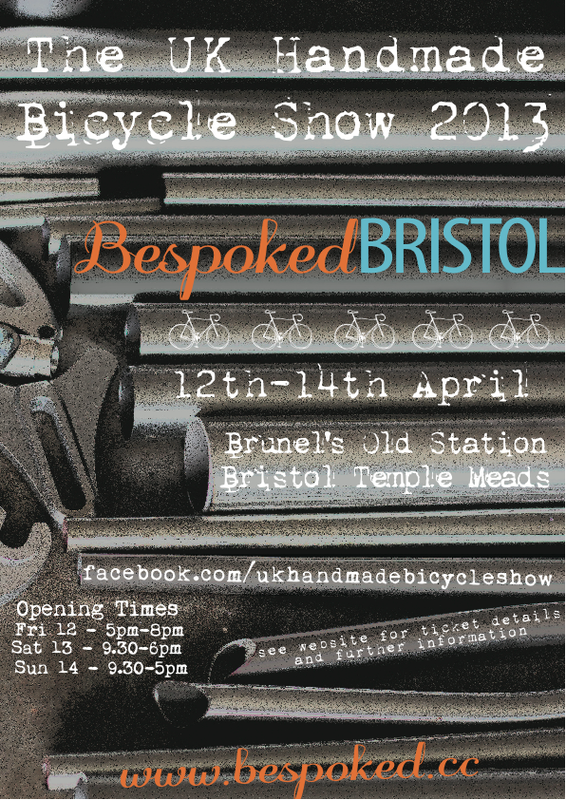 Britain’s best handmade bike show is coming back to Bristol and will offer everything for the cycling enthusiast. Between the 12th and the 14th of April the best in the business will descend on Brunel’s Old Station for exhibitions, stalls and hand crafted bicycle parts. This is a superb location in the centre of Bristol next to Temple Meads railway station. Whether you want to cycle, walk, drive or take the train this is without doubt the most accessible place in Bristol and perhaps the South West. And if you join us you will be in global company as we are welcoming over 70 leading independent bicycle makers from the UK, Italy, France, USA, Germany and Japan. This is your chance to look at or buy some of the most beautiful and desirable cycles on earth. The festival is open from Friday 12th from 5pm-8pm, Saturday 13th from 9.30am to 6pm and Sunday 14th from 9.30-5pm so we look forward to seeing you here for at least one of these sessions. This entry was posted in Bespoke Bike Show and tagged bicycle makers, Britain, handmade bike show, independent bicycle makers, temple Meads. Bookmark the permalink.